Peter Ortoleva has worked for the past 32 years in the analysis of reaction, transport, mechanical systems. 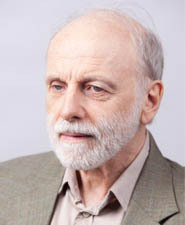 His research crosses traditional disciplinary boundaries between chemistry, computational sciences, informatics, and physics. With his graduate students and post-docs he has developed a number of theories and reaction-transport codes with applications in fundamental biological sciences and in the pharmaceutical and nanotechnology industries. His background in the analysis of a variety of nonlinear reaction, transport, mechanical phenomena has led to breakthroughs in the theory of self-organizing systems. He has written 2 monographs, edited 3 volumes, and published over 200 peer-reviewed papers on reaction transport phenomena. Research in the Ortoleva group studies the use of multiplex bioanalytical data, notably microarray and exon array information, to identify therapeutic targets and mechanisms for the onset and progression of cancer and diabetic tissue damage.